It's not surprising to see why so many people love the graceful and elegant Giraffe. 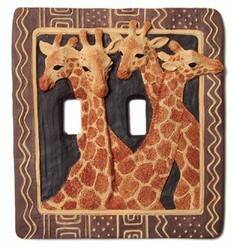 You can purchase some truly unique items from Amazon including the Giraffe Double Switch Plate Cover which is handpainted. 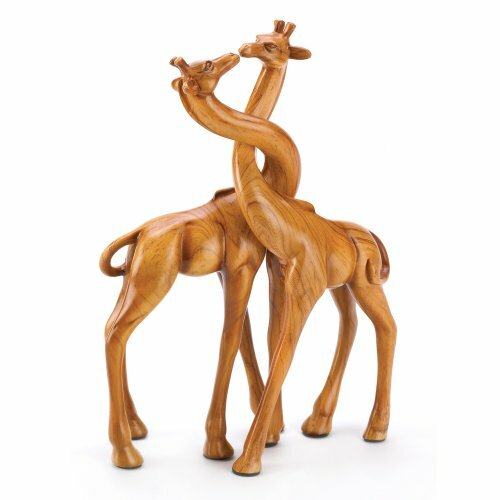 If you're looking for the perfect Giraffe items for yourself or for someone else as a gift, then here's a handy and time-saving page which has grouped some beautiful Giraffe ideas together for you, like the brilliant Melissa and Doug Huge Plush Giraffe that kids and adults love so much. A stuffed Giraffe plush is a wonderful idea for kids and adults who collect them. Certainly most young girls and boys love soft, cuddly toys so you can't really go wrong giving one as a gift. How amazing is this giant Melissa and Doug plush giraffe! It is 57 inches tall and towers over little kids. Lots of people purchase toys like these as safari and wild animal themed nursery decor. It just totally encapsulates the spirit of the giraffe. Melissa and Doug make great quality toys. My daughter is a huge fan and has many of their wooden puzzles, bead sets, stamping sets, a wooden toy farm and an amazing, pink wooden castle which is utterly adorable. As parents, we love Melissa and Doug toys because they are well made and last. My daughter loves them because they are cute and fun. The Webkinz (another good make) Giraffe looks so adorable and that's why I had to show him off. Webkinz stuffed toys all have unique codes which kids can use to enter a safe, online play portal where they can 'interact' with any pets they collect. I also love the big-eyed Ty Beanie Giraffe which is small and super-cute. He would make a wonderful little gift or even a stocking stuffer. I can hardly resist his staring, dark eyes. There are plenty of safari themed toys available for kids to play with. Think about pull-along toys for toddlers, realistic play figurines, puzzles, coloring books, masks and costumes, zoo sets and more. I've picked out 3 stand-out toys which myself and my daughter both liked. 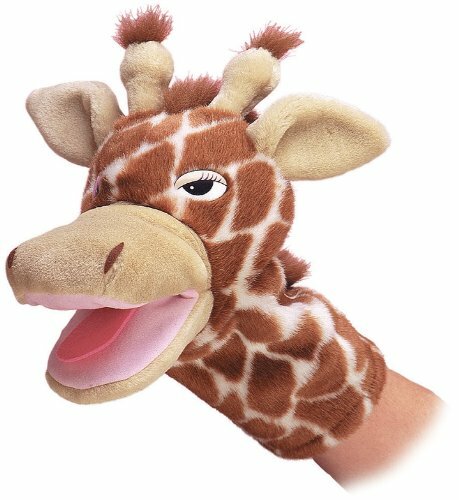 A plush giraffe puppet which you can pop on your hand to move its mouth. Young kids, normally under 8s, really enjoy puppets. Teachers often use them at school in order to help and encourage children to talk in groups. So puppets can help shy kids enormously. My little girl loves her dad to put on a silly voice when using a puppet and they make up stories which sound silly but really help to fire the imagination of a young child. Sticky mosaics are wonderful for kids who enjoy arts and crafts. They're like a mess-free version of paint by numbers. Recommended for ages 6 and up, in this pack you get 4 wild safari themed boards and plenty of pre-cut, thick foam stickers (easy for kids to hold and stick) which will make up animal pictures when completed. They take some concentration to do and help to keep kids occupied in a fun and rewarding task. Puzzles are good for all ages. This 60 piece puzzle would be good from about 5 years of age. Note that it's a good idea, before buying a puzzle, to ask parents or carers how many jigsaw pieces it should have to suit their child. I wish people would ask me before buying certain toys like puzzles where you're unlikely to know the specific ability of the child unless you're the parent or carer. We still get given counting books with numbers from 1-20 though my daughter could count to 100 as a toddler and is now at school and doing basic math. It is unfortunately a waste of a gift when it's so easy just to ask. Unwanted toys are never wasted because we gift them to the local charity shop which raises money to care for unhomed pets. So they go to a good animal cause. These giraffe cufflinks would look amazing against the fabric of a black, dress shirt. And also would be a good choice for a man who loves to wear flamboyant, african printed shirts. The giraffe cufflinks are incredibly realistic looking. I love this chunky looking giraffe necklace which looks very tribal indeed with the black cord. A perfect gift for someone who loves costume jewelry rather than precious jewelry. My mom would hate this because she'll only wear traditional gold jewelry, but I love it because I only wear costume jewelry. The great thing about costume jewelry is that you can easily purchase enough to accessorize with all your outfits - and not have to worry about it getting stolen which is what sadly happened to a friend of ours who had her house broken into. They took all her precious jewelry that will never be replaced. Giraffe jewelry is good for women and men. I've shown you some favorite pieces but there are plenty of other items which feature giraffes like earrings and bracelet charms. Charms are great to collect for babies and young children. My sister bought my little girl a charm bracelet when she was born and gives her a new charm every year. Such a sweet idea. A gold-plated and adjustable giraffe ring is very eye-catching. I've seen one that features two giraffe heads resting, side by side. Giraffes actually do this. 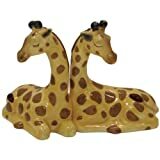 I've seen plenty of images of giraffes where their heads are intertwined or resting together just like the designs show. That would make an ideal friendship ring or a ring for someone you are close to so you can celebrate that togetherness. Giraffes are great inspiration for home decor. The colors are warm, rich and inviting. Fabrics tend to be thick and plush. Perfect to enrich bedrooms and shared living spaces. The wall sconces here will add a touch of the dramatic to a room. They are decorated with animal prints and you can see the giraffe markings. This would be wonderful to add some candle light above a dining table for enchanting meals. Or to decorate a bedroom wall. How about this grazing giraffe trinket box? It's a beautiful enamelled, limited edition collectible figurine that also doubles as a little jewelry box. This is a gorgeous piece to have on display and any giraffe lover will adore how this looks. This giraffe is crafted out of fine pewter. It is then hand enameled and adorned with genuine, glittering Swarovski Crystals which really do catch the light. 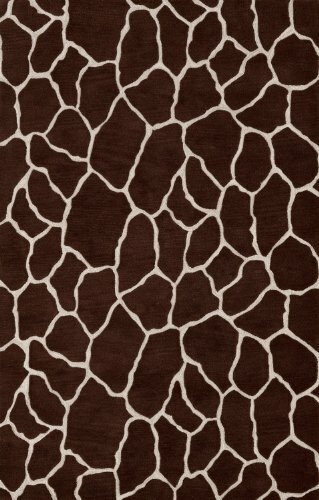 A giraffe pattered rug is a sound choice of gift for someone who has an African, jungle or safari themed room. Rugs lend instant warmth to a room which has hard floors. And they also provide a nice play area for young children too. We have wooden, bamboo flooring in our home and my daughter will always pick out a rug to sit and play on. Cushions and pillows are another great gift idea if you're struggling to think up great presents. They're items which often need replacing in homes and are very welcome to add some color and spice to a room. Giraffes make super cute gifts for babies and many parents and carers do decorate nurseries with a safari or jungle theme which is a nice introduction for babies to the world of animals. The Wubbanub Infant Pacifiers are well-loved by babies because they feature a pacifier with a large, plush and super-soft animal. 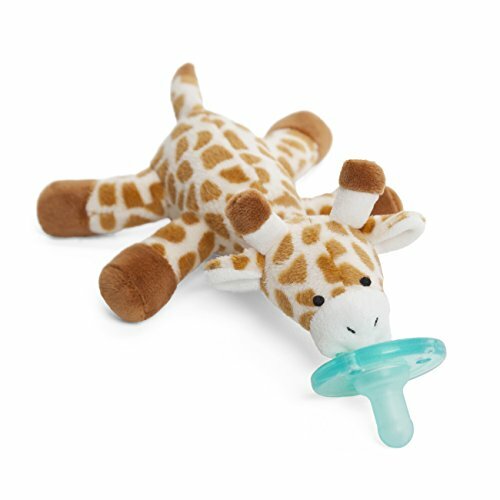 The giraffe pacifier is adorable. Note that you should never gift a pacifier to a baby unless you know that parents do indeed use them or your gift might not be welcome at all. For babies who love pacifiers, this has to be the creme-de-la-creme! A lovie or baby security blanket is always a great baby gift choice. 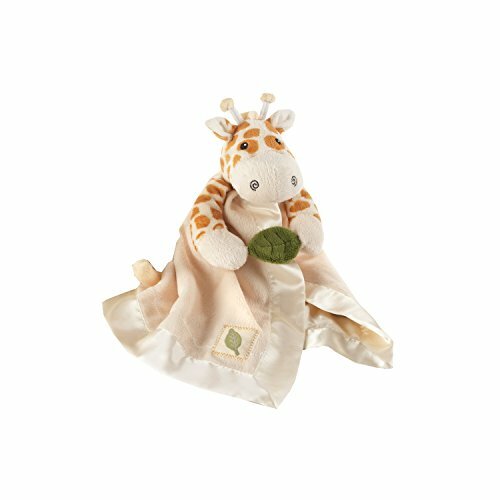 This super-soft giraffe lovie comes with baby-safe embroidered eyes and a cream color satin trim. He is holding a green leaf which crinkles when you the baby touches it. Great for a baby boy or girl with the neutral coloring and would make a wonderful gift for a baby shower. For a slightly older baby who is able to sit up, stacking toys are fun and help with baby co-ordination and thinking processes. This fisher-price giraffe stacker is very cute and features different sounds and textures to amuse the baby. How about a Safari, Wild Animal or Giraffe themed nursery? It's wonderful to create a special themed nursery for a child. We had a pale pink and red strawberry theme when my daughter was a baby but we didn't choose that very girly theme until after she was born. With a giraffe themed nursery, the colors are pretty neutral and would suit either a boy or a girl. So you would be able to decorate the nursery well in advance of the baby's arrival. 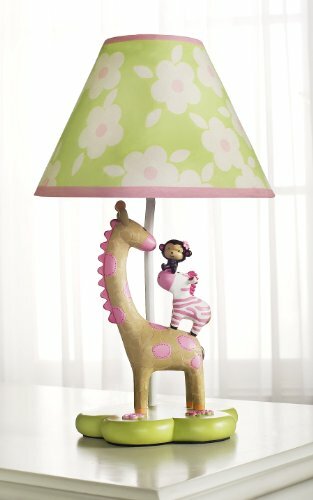 I love this fun, pastel polka dot lamp which has been adorned with safari animals at the base. It is extremely cute. How fun is the giraffe musical mobile where a long (fabric covered) giraffe's neck attaches to the crib. The giraffe is holding jungle tree-top leaves with some soft jungle animals dangling down. The mobile turns round to some soft music. 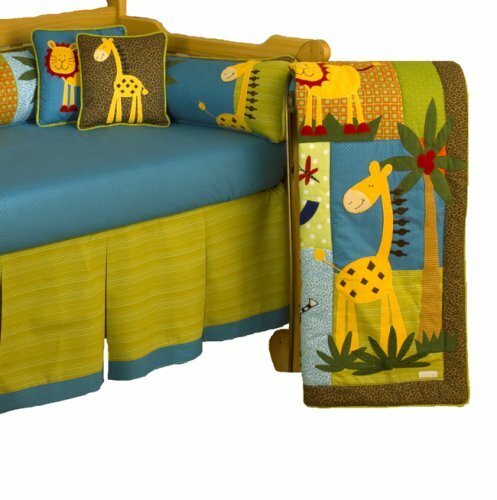 If you're not sure what to get as a nursery or baby gift, here's a very stylish 4 piece crib set which includes a matching giraffe quilt, bumper, dust ruffle and fitted sheet. Babies tend to spend a lot of time in cribs and strollers so it's wonderful to give them things which they can spend time looking at as well as items that move slowly and make gentle sounds. Anything to stimulate a baby's interest whilst they are awake. Do you love the Giraffe too? Thank you. It is nice to hang on to good memories. My husband still has his very first stuffed toy (a lamb) which he won't ever get rid of even though it only has one ear and one eye! During my childhood, I had a stuffed giraffe toy. I liked it pretty much. it is good to remember of those little things that meant so much in some period of your life. Thank you @Lindsey. Giraffes are a wonderful choice for boys and girls and there are lots of jungle and safari themed toys which include them. I hope you find some lovely giraffe gifts. Excellent, this is perfect for kids. I am actually looking for presents that are both for boys and girls. Thank you @sojourner - glad you like my giraffe page, I add to it when I find more interesting giraffe items as well. I am also a giraffe fan. This is a great page with a lot of great gift ideas. Giraffes are magnificent and these gifts are adorable. Thank you - I appreciate your visit to my giraffe page.